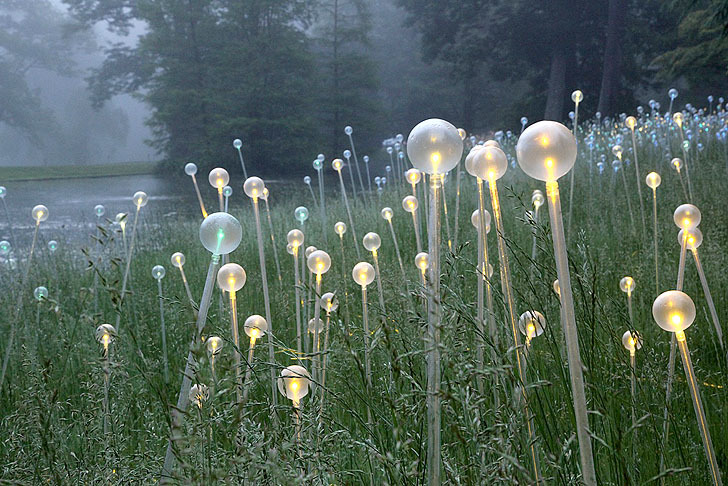 Bruce Munro's Gorgeous Fields of LED Flowers Bloom at Longwood Gardens! We've featured Bruce Munro's gorgeous fiber optic lighting installations in the past, so we were thrilled to hear that he just unveiled his latest work at Pennsylvania’s Longwood Gardens! The solo exhibition opened this past weekend, and it brings thousands of glimmering LED lights to Longwood’s grand conservatory as well as 23 acres of outdoor space. Munro Installed a total of eight glowing installations, which mesh with the lush plants and flowers of the historic gardens just outside Philadelphia. “Light: Installations by Bruce Munro” marks the artist’s first large-scale solo exhibition. His fantastical pieces harmonize within the landscaped grounds and antique greenhouses, creating a glowing wonderland best seen at night. Six outdoor installations weave Munro’s lights into the fabric of trees, flowers and shrubs that make up the legendary Longwood Gardens. 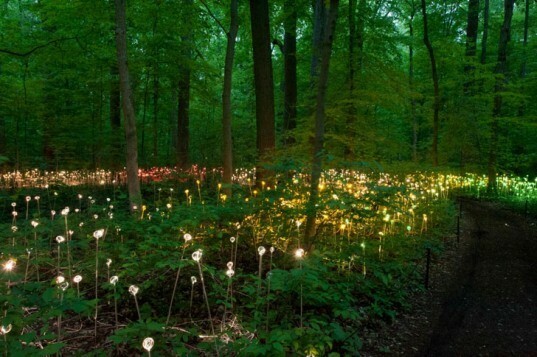 “Forest of Light” and “Field of Light” emulate fields of dandelions as they sprawl across the forest floor and line the banks of Longwood’s pond. Over 20,000 LED-topped stems adorn the forest, while 7,000 additional stems set the pond aglow. The patches of LED flowers bloom at night, creating gentle illuminated fields of color that welcome visitors to wander along the water’s edge and beneath the forest’s canopy. Munro’s “Water Towers” feature glowing glass bottles stacked up into columns. The 69 towers are set up in a meadow to create a maze of rising forms that change color in synchronization with music. Water lilies and paths of low blooming flowers are also mimicked with gentle patterns of light throughout the grounds. Inside, installations with candles, chandeliers made up of over 100 glass balls, and a glittering shower of LED droplets create a fantastical landscape within the already magical interior gardens. Munro’s amazing light installations are on display at Longwood Gardens until September 29th. The exhibition is paired with exquisite programming and events for the entire family to enjoy. I would like to know the price of these LED lights (Bill Munro's).. Are they for sell? If so, where? I am in Metro Detroit area. Thank You, kindly! he needs to do this at Botanic garden in Glencoe, ill !!!!!!!!!!!!!!!!!!!!!! “Light: Installations by Bruce Munro,” marks the artist’s first large scale solo exhibition. Over the summer, his fantastical pieces harmonize within the landscaped grounds and antique glasshouses, creating a glowing wonderland best seen at night. Six outdoor installations weave Munro’s illuminations into the fabric of trees, flowers and shrubs that make up the legendary Longwood Gardens. “Forest of Light” and “Field of Light” emulate fields of dandelions, sprawling across the forest floor and lining the banks of Longwood’s pond. Over 20,000 LED topped stems adorn the forest, while 7,000 additional stems set the pond aglow. The patches of LED flowers bloom at night, creating gentle illuminated fields of color that visitors are welcome to wander through along the water’s edge and beneath the forest’s canopy. Glass bottles are stacked into columns on a meadow for “Water Towers.” Glowing from within with colored LED lights, 69 towers create a maze of rising installations, that change color in synchronization with music. Water lilies and paths of low blooming flowers are also mimicked with gentle patterns of light throughout the grounds. Munro creates chandeliers by gathering of over 100 glass balls, filled with LED lights. A glittering shower of LED droplets create a fantastical landscape within the already magical interior gardens for another installation. Munro’s amazing light installations are on display at Longwood Gardens until September 29th. The exhibition is paired with exquisite programming and events for the entire family to enjoy. Tickets are going fast, so plan ahead. The exhibition also has an accompanying iPad and iPhone app.